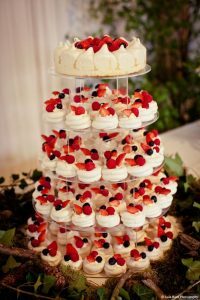 Wedding cake alternatives for those that want to do things their own way. The ‘cutting of the cake’ has somehow become a part of this ‘wedding day timeline’ that most wedding venues feel you must adhere to, but as an Essex wedding photographer always up for going against the grain, I’m all for those seeking wedding cake alternatives and changing things up! Don’t get me wrong, wedding cakes can be lovely and if you’re a cake lover then of course you’re going to want big slabs of cake to smush into each other’s faces, but if you find the idea of a wedding cake a bit too ordinary and want to offer your guests something different then you’ve come to the right place! I’ve put together a collection of wedding cake alternatives to sink your taste buds into. I mean come onnnnn… who doesn’t love doughnuts?! If you don’t, well then, we need to have words. Doughnuts can be made suitable for any guests with vegan/gluten dietary requirements and are such a great easy-eat treat that can be displayed in so may different ways. Doughnut walls, doughnut towers, hanging doughnuts, whatever you fancy! 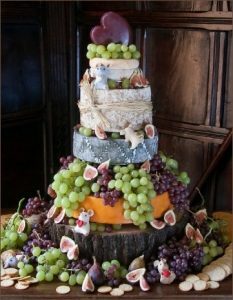 These wedding cake alternatives are so versatile and can even be decorated to suit your wedding theme. 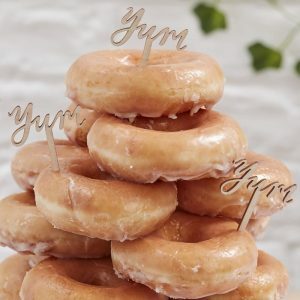 Super cost effective you could source your wedding doughnuts from anywhere – go for a well-known Krispy Kreme or perhaps head to your local bakery and see if they could offer you a deal (guarantee these will be made with the most love!) Jade + Chris’ fairground themed wedding in Essex featured huge fresh doughnuts from their local bakery and they were sooooo scrummy! After a bit of crunch? Meringue could be great wedding cake alternatives for you. Super sweet and delicious clusters of sugar topped with some fresh cream and fruit is such a wonderful combination. Can be served either as individual small deserts for guests to grab at their own leisure of perhaps you’d prefer a big slap of pure meringue to slice into and serve. 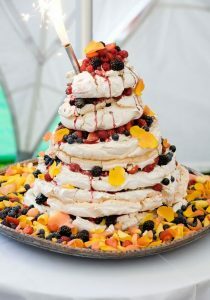 Whichever option, meringue is always a crowd pleaser and yummy wedding cake alternatives. 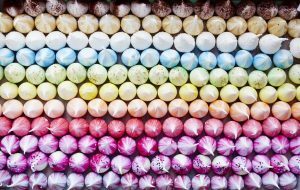 In the Essex/London area there is a company called Meringue Girls who offer the most colourful meringue kisses which are so aesthetically pleasing, check them out! When I was in Florida these were everywhere and my favourite thing ever. Anyone remember Square bars? Heck, why am I asking if anyone remembers acting as if I haven’t had one since I was a kid… I still love them now! Just a delicious mush of rice crispies and melted marshmallow. 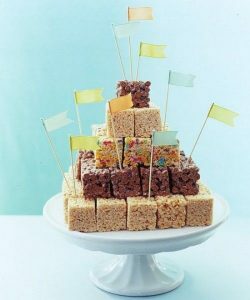 So simple, cheap and easy, yet totally wonderful wedding cake alternatives. Savoury or sweet, pies come in a load of different varieties. 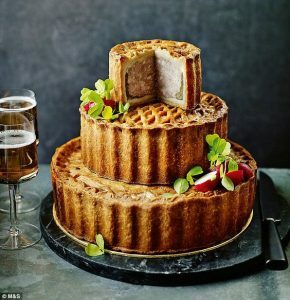 Imagine a giant pork pie as your wedding cake alternatives, it’d definitely give you guys a run for your money as the most photographed that day! Such an unusual idea and yet perfect for those having an outdoor wedding and have no way of refrigerating a cake that will most likely melt. 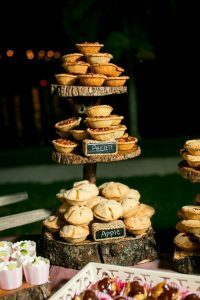 Fruit pies can also make fab wedding cake alternatives and you could even give making these a go yourself and customise the fillings to your tastes. If you’re wayyyy more disciplined than me and would you rather save your calories for your hog roast or 3 course dinner (madness, it’s your wedding day, calories don’t count!) then fruit could be an option for you. 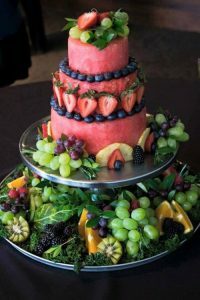 Perhaps you’re getting married outdoors on a Summer’s day so want to offer guests a refreshing dessert, Fruit could be the ideal wedding cake alternatives for you. Full of vibrant colours fruit can add life to any setting and offer a welcome relief from all of the other wedding food naughtiness. 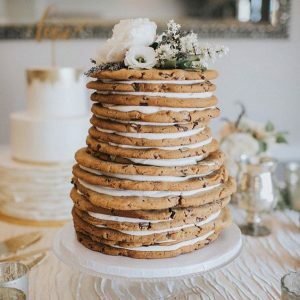 Maybe you love all kinds of different desserts and don’t want to limit yourselves and your guests to just one option of wedding cake alternatives… if this is so then have them all! I think this would totally be what I do if I get married because how could you possibly just choose one! 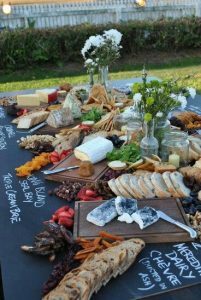 Instead, create a wonderful spread of all of your favourite treats and let guests tuck in at their own leisure. 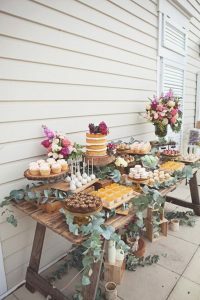 At the Becky + Colin’s Priory Hall wedding in Suffolk, Becky created the most beautiful dessert table complete with an array of goodies and dry ice(?!) – amazing.